Epikeia® is an acetone and polymer-based skin coating technology that has been developed as a combination barrier product and drug delivery vehicle. The technology has the potential to address numerous distinct clinical applications by incorporating active ingredients to create dermatologicals, active skin care products, and cosmeceuticals. The murine croton oil test is a frequently-used inflammatory test to demonstrate the efficacy of topical corticosteroids. In this model, croton oil is used to induce inflammation in the ears of mice. The extent of the edema of the ear corresponds to the degree of inflammation. Once treatments are applied, the swelling abates which permits quantification of the anti-inflammatory effect by comparison to the non-treated contralateral ear. Female ICR mice were divided into ten groups of 5 mice each. Ten mL of 5.0% croton oil in acetone was applied to the dorsal surfaces of both ears, except in an untreated control (croton oil applied to left ear only). 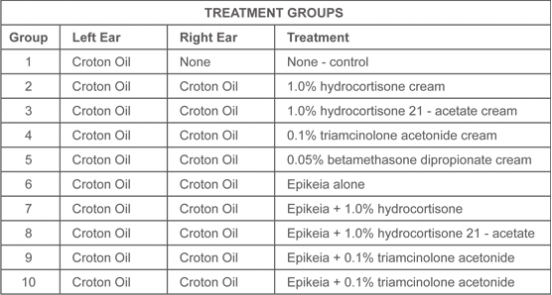 Five minutes after administration of croton oil, the right ears of mice in the remaining groups were treated as described in the table below. The extent of the edema which formed (ear thickness) was measured using a caliper with a minimal gradation of 0.05 mm. Ear thickness was measured at 0, 6, 24, and 48 hours. The degree of anti-inflammatory efficacy is determined by the difference in ear edema between the untreated and treated ears. An analysis of variance and covariance with repeated measures was completed. Any significant F statistic was followed by a post-hoc t-test to determine group significance. Significance was set at p<0.05. In all corticosteroid groups (both Epikeia and cream), at the 6- hour time point, all formulations showed a significant reduction in edema. The group treated with Epikeia containing no corticosteroid also showed a significant reduction in edema, but to a lesser extent than that of the corticosteroid groups. Without the inclusion of corticosteroids, Epikeia coatings demonstrate a significant reduction in edema. Epikeia with 0.05% betamethasone produces a more rapid reduction in edema over time (24h) compared to the cream product. Results (not shown) are similar for Epikeia coatings containing hydrocortisone, triamcinolone acetonide, and hydrocortisone acetate. Electron Micrograph of Epikeia coatings with betamethasone before (top) and after liquid extraction (bottom). The drug appears to be located within the porous structure of the coating, allowing for sustained release of medication over extended periods of time. The specimen below, taken from a slightly different angle, reveals comparatively more porosity after a 24 hour methylene chlorine “washout” period. 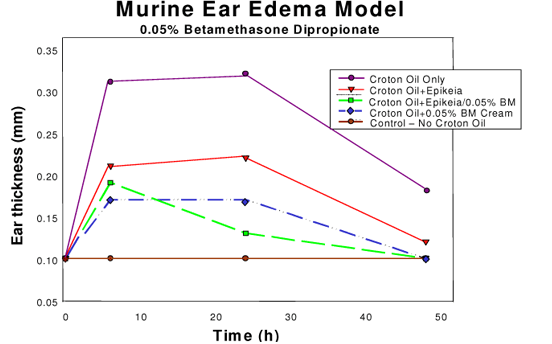 This study demonstrates that the Epikeia formulations with and without corticosteroids reduce edema in this croton oil model. The Epikeia corticosteroid formulations were found to be a more effective drug delivery vehicle than the cream formulations at the 24-hour time point. The enhanced reduction at the later time point is an indication of the sustained drug delivery capability and potential benefit of the Epikeia drug delivery vehicle. Niedner R. Pharmacological Aspects: Animal Models., in Topical Corticosteroids, H.I. Maibach and C. Surber, Editors. 1992, Karger: Basel; New York. p. 7-16. Funding was provided to Biomedical Development Corporation by the National Institutes of Health / National Institute of Arthritis and Musculoskeletal and Skin Diseases – SBIR No. 1R43AR45152.